Cryptocurrencies are the latest craze sweeping the world, People are finding the ways how to min cryptocurrencies and implement it. Now, Google bans all cryptocurrency mining extensions from Google chrome store. This move is taken to protect users from extension crypto jacking. Google, tells that there had been a surge in “malicious extensions” over the past few months Google Chrome store. These malicious extensions, actually embedding hidden cryptocurrency mining scripts that run in the background without permission, consuming valuable computing resources. The company says, Soon the existing extensions will remove from Google Chrome Web Store in late June. Also, The extensions “other than mining” will still be permitted for blockchain-related purposes. Moreover, The company says about its extensions store that is around 90 percent of all extensions with mining scripts submitted by developers have failed to comply with Google’s policies. As a result, they have been rejected or removed from the store. In terms of CPU usage, Mining is tough, the time taken, run the rigorous calculations (needed to mine the digital tokens)and can negatively impact system performance. 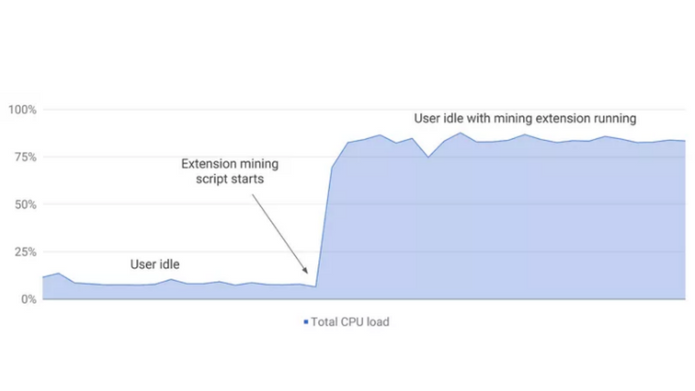 Previously, Google allowed cryptocurrency mining in extensions as long as it was the extension’s single purpose and the user was informed about the process. For the cryptocurrencies mining, Several scripts are used with the extensions used. These mining scripts often consume significant CPU resources, and can severely impact system performance and power consumption. According to the reports, bitcoin reached highs of almost $20,000 last year, At the height of bitcoin’s price gain, around $64 million (£45 million) in the digital coins was stolen from NiceHash, a cryptocurrency marketplace. Late last month, The companies like Twitter and social media giant Facebook banned cryptocurrency ads.